OK so I was perusing Jackie's blog when I saw a name of another blog that sounded interesting. I have gotten so into sketches lately - I do wish I could up with some on my own. I would love to start a challenge blog with sketches, but since there are so many... Anyway, so I clicked the link to Friday Sketchers Blog and found this great sketch to play with. I stayed very true to the sketch, not changing any part of the layout. I used my new set that I just got from Sweet n Sassy. In that order I also got a package of Neenah cardstock. LOVE it!! It runs great thru my printer for digi's and it holds the color of Prismacolor markers with no bleeding! How awesome is that! Anyway the dp is from an old Spring paper pack from Stamin' Up! - the sentiment came in the Sweet n Sassy set. I layered the two prima flowers and ended up with a jonquil but I like it! Anyway, it was a very fun sketch. 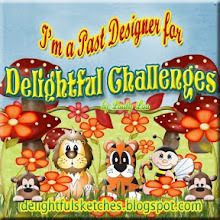 Today is my very last posting as a DT Member for the Corrosive Challenge blog. I can't believe how time has just flown by! 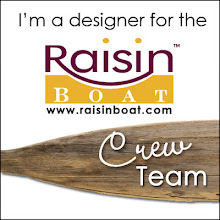 I want to take this time to thank Janet for inviting me to be one of the members of her first design team. It has been such an honor and so much fun! So today's challenge is a card I wish I hadn't had to put into use. 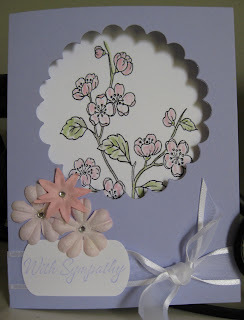 Today's challenge is to create a Sympathy card. I used a digi-image from The Digi Shack and since I live so near DC, the sweet Cherry Blossoms are familiar. This was a really easy card to make. I printed the digi out on white card stock and colored using inks and blender pens and adhered to the inside of the card stock. 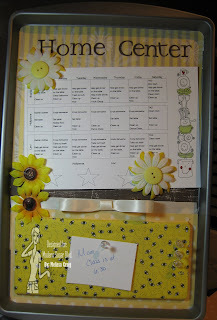 Then I cut the window with a Nestabilities die, added primas and ribbon. I stamped the sentiment in Almost Amethyst and it didn't photograph well. Thanks for the fun ride, Janet! This is Precious Hippie Chic. I made this card last night and it really was a challenge for me. 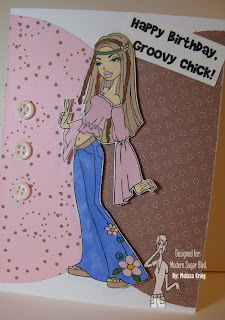 I am so not 60s and 70s retro, but she's got a sweet face and reminded me of my niece who would love this card! This is 'I Can Do It' and she is so adorable. The image does come with a lower half of her anatomy and her other arm is holding a tool box but I absolutely love her face. She's so lovely that I felt I needed to zoom in on that. I fixed up this notebook that I picked up at the dollar store. 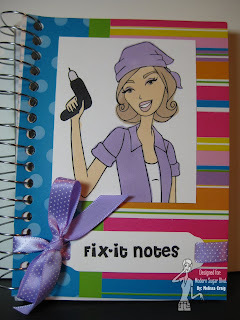 I thought this would be really nice to have around to enter notes and measurements and maybe even swatches for home improvement stuff. With the housing market as it is, people are fixing up what they already have instead of buying new. And last, but not least, is my altered cookie sheet message center. 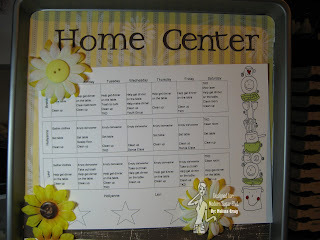 I saw this idea on Heather's blog and loved it. I still have to have the holes drilled in the top for ribbon to hang this up - but other than that, I think it's pretty cute. The upper portion is a chore calendar and when I saw the Stacking Up image that was the first thing of I thought of to use this digi on. My oldest son saw it and said "oh man! Now we have lists!" LOL The lower portion is foam core board covered with this cute bee fabric I've had in a drawer. The flowers are magnets that I put together with some jumbo flowers. The letters are from a Cuttlebug set of alpha-dies. I hope you enjoyed my little runway collection of the new releases. I'll post the challenge card later. Have a super Saturday. Hi - Happy Friday! Whoo-hoo - I just love short weeks! We'll start today's entry with Hollyanne's Friday Feature card... she has some really great ideas in the works but she didn't have enough time tonight to work on them. 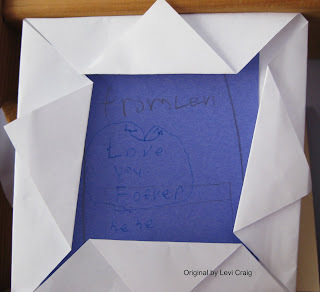 She only had 15 minutes to bedtime so she created a simple and very cute card in minutes that I know any one of her little friends would love to receive. I think it's going to her pen-pal. She finished it and showed it me and my question was "what stamp is that?" LOL That girl knows more of what's in my collection than I do! This is Lizzie Ann stamp set. The sentiment is from a leftover package of rub-ons that she asked if she could have. And (Gabby are you listening?) I can't keep that girl out of my Prismacolor Markers! She said that she can't wait until I discover better markers 'cause then she'll get the prismas. Haha! OK and for my Friday feature... Be on the look out for new releases over at Modern Sugar Blvd. We were told we didn't have to sneak peek, particularly if one didn't get their projects done until the day before they were due... ahem! In a way this is a sneak peek 'cause this in only a portion of the project. Come back tomorrow for a better look. I'm back to work today which is sort of hard after a fabulous weekend. Even hanging out at the in-laws for a short time wasn't half bad, even though my father-in-law ended up stabbing me with a fork trying to get a big, black spider off of me. He didn't puncture my skin, but it hurt for a bit and I wore potato salad dressing for the rest of the day. I have found another really great blog for challenges. 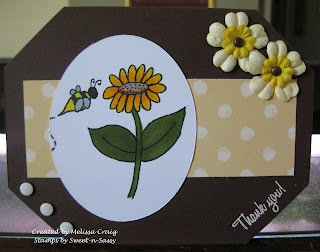 I made this card to participate in Crafts 4 Eternity's Sketch Challenge #33 - this is a really great sketch with so many possibilities. This also makes my design for one of my groups for the Monthly Card Challenge. Gotta love the 2-fer creations!! Oh yes, not to forget the best part of the challenge... they are digi-stamp company, too, and are releasing a new set of teen images. Very cute. They are giving the digi-stamp set to a random winner. 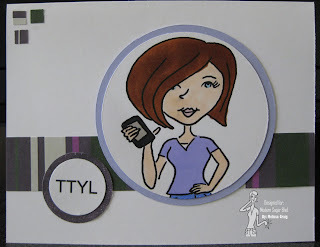 So part of the challenge is to create a teen style card. So Miss Anya partying at the mall was a perfect choice. So the monthly card kit, the sketch and the theme all worked together perfectly! I used chocolate chip for the base, then Very Vanilla that I embossed with Spots & Dots. 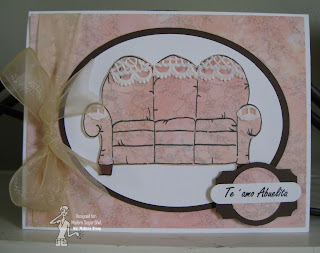 The decorative paper that was sent in the kit is The Paper Studio and other dp used is from a retired set from Stampin' Up! - time to stop hoarding and start using!!! I colored Miss Anya using Prismacolor Markers (Deco Pink, Cream, Light Olive Green, Buff, Light Walnut, Dark Umber and Cherry) - I wanted to create her to be a girl that can either be tanned... or Hispanic... or African-American. I love Buff for those skin-tones. And I used the wonderful (but sometimes tedious) technique of paper piecing. I hope you like her and will try the challenge with C4E. Thanks for visiting me today. Hello! I hope you're enjoying a wonderful holiday weekend! An angle cut on this side and that and I had a A-Frame house. Add a scalloped straight-edge and now I've got a Gingerbread roof. 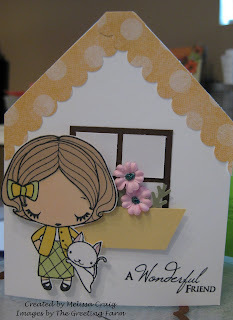 The painful part of this is the windows - lots of cutting, but I think it came out really cute! It needs curtains, but I just couldn't bring myself to do more cut work. At this writing it did occur to me how I can accomplish curtains pretty easily. This card is my proto-type. It would be cuter with embossing on the window-box. But anyway, then I used Reeta from the Wild Sprouts collection and the sentiment from For Someone, both from The Greeting Farm. Reeta is colored with Prismacolor markers (Eggshell, Tulip Yellow, Light Walnut and Avocado). Thanks for visiting and enjoy your Monday! Good Morning and thanks for coming back to for my 2nd post of the day! I love this ribbon that I picked up out of the dollar bin at Michael's. I used it just yesterday on another card. 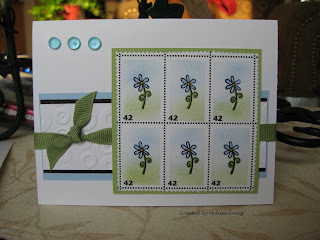 The flower stamps are from Scrappy Cat and sentiment is from Inkadinkadoo. I can't wait to see what you come up with!! Well I'm off to make a salad and a peach cheesecake for tomorrow's cook-out! Have a safe rest of your weekend. Hi Everyone! I hope you're enjoying a fabulous holiday weekend! 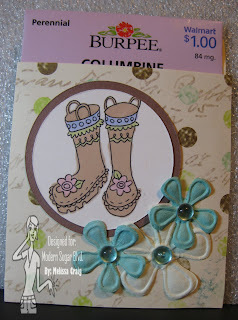 I belong to a challenge group that does 2 cards each month and I just recently went back to doing these (see Faux Leather cowboy card) and it was my turn for the challenge topic. I chose faux postage. My sister sent me a card months and months ago using this technique but I've never actually tried it, so I thought I'd give it a whirl. This is fun!! I made this card for two purposes actually, I made it to send to my challenge partner but I followed a sketch that a found via Toni from The Digi Shack. 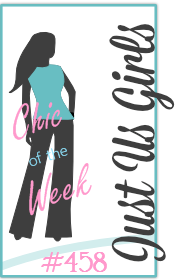 She's providing the prizes of any 2 digi's for this week's challenge on Card Patterns. Visit the blog for details and the awesome sketch. This is the picture of the bling that I took. My craftroom is downstairs and is in the front of the house which faces west, so I get the setting sun in my windows. I had the shade open because the kids were out playing most of the day, so the sun was shining rather brightly in the window. I had just placed these pieces and I thought the way the sun was hitting them looked cool so I wanted to take a picture. Neat, eh? It's me again! It seems my trend with my blog is that I double post on Saturdays (one for me, one for MSB) and then post on Sunday... but by Wednesday I sort of dwindle. Anyway, here's the me! I rarely get to participate in challenges anymore. I'm busy with my DT work for Corrosive Challenge and Modern Sugar - I'm not complaining, mind you, I love what I'm doing. But I rarely participate in a challenge just because I want to. This card is two-fold. 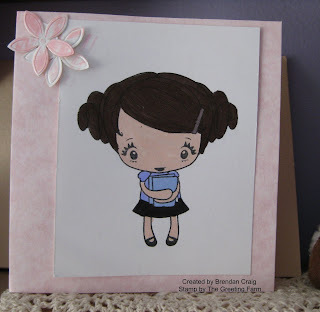 I stumbled onto a blog called Crafts 4 Eternity and they are featuring this coolest sketch challenge! 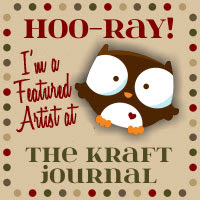 Also, Tami Mayberry posted a contest to win a Father's Day digi-stamp set. All you have to do is use one of her sets that she drew for Sweet-n-Sassy. The above image is Tami's! This card features the great set from Sweet-n-Sassy, but the red oval in the background I stamped with Papertrey Ink's Polka dot set and embossed with white embossing powder. I have honestly forgotten how fun heat embossing is! And guess what, I'll bet you'll find a card posted later with the rest of the red card stock that I cut the oval from. Hollyanne swiped it! I had great fun with this sketch and digi-stamp set. Hi! So glad you're back for the challenge! 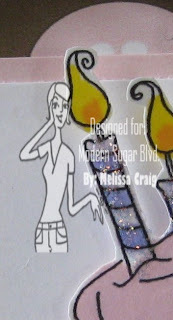 Be sure to visit Modern Sugar Blvd. for all the details of this week's challenge. It's a sketch and a color challenge. Can't wait to see what you come up with. The color combo is pink, brown and ivory. I missed the mark on ivory but I'm happy with my card anyway. 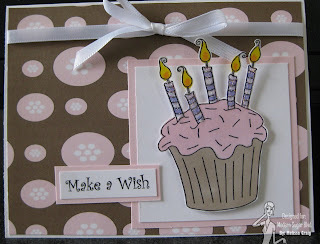 I love this cupcake image from Modern Sugar Blvd. The dp is free digi-paper from GinaK Designs (Neapolitan 2). I used Prismacolor Markers (Deco Pink, Light Mocha, Violet Mist, Canary Yellow and Yellow-Orange) to color the image and then dabbed on a bit of stickles. I'm running out - my daughter keeps using up my stickles!! LOL The solid mats are Pink Pirouette. The most absolute perfect pink ever!! I hope you play along in the challenge!! I am starting a new thing on my blog today called Friday Feature. Who am I featuring? My daughter. Hollyanne is improving her stamping skills and I told her for every really good card that she takes her time to make really special, I would feature it on my blog. So here's Hollyanne's first feature. Hollyanne is completely in love with The Greeting Farm's Miss Anyas collection. I haven't told her about the new one that is sooo awesome! She's also discovered my Prismacolor markers. 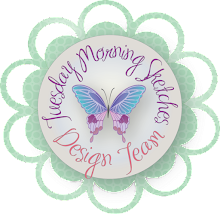 After chats with Gabby about the markers and falling in love with them, I gave my entire collection of Stampin' Up! markers to Hollyanne. But she's wanted to try mine and is hooked! 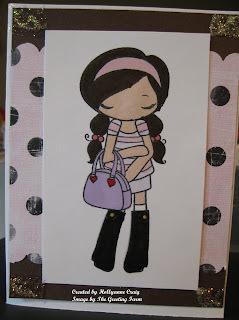 She used some leftover digi-paper that you've seen me use, layered over chocolate chip cardstock. Of course, my girl can't make a single card that doesn't have glitter on it, so she created her own type of embellishment with rectangles of stickles in the corners. I hope you enjoyed this feature! Thanks for visiting us today. Oh, by the way, she's hosting her first swap via me - you can find it here. We'd love to have you join us. 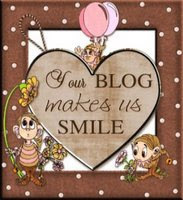 OK, Dee the Blog Police has issued a warning! LOL Get those sneak peeks up! So here it is... the sneaky peek to Saturday's challenge and let me tell ya! It is sweet! Hope to see you back here on Saturday! Another post - this one has to be quick. Modern Sugar Blvd. is having a mini-release today and these images are soooo cute!!! This is So Charming - and she's sooo adorable! I just love her wild hair and sassy personality. 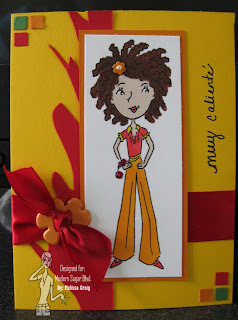 My card sentiment is Muy Caliente and she is all that! LOL I freehanded the flames - my daughter said I should have had one of the boys do it 'cause boys are good with flames. I love the bright colors - they're so spicy! This is I Love My PDA. My card is clean and simple and features her lovely face. With digi's you get to decide on the size of the image and I wanted to focus on her face. Cute! Well, jump on over to Modern Sugar Blvd. and get these girls in your digi-collection! I have a fabulous set of cards to share with you!! As I've shared with you before I host a monthly card swap and each month is hosted by one of the participants who have to send paper and images. I am so happy when the hostess sends a bit extra to cover the mishaps that can happen. SGC was the hostess for May and sent along this great paper and Skater Ian by The Greeting Farm. I didn't have any mishaps, but was so happy when my kids got involved. Before I get in trouble with my daughter, she picked out the font which is called Rita from Dafont.com. It's Sunday and another great challenge from The Corrosive Challenge blog. This one is music to my ears! And here's my take on the challenge. Since my house's general noise most weekends consists of Guitar Hero, Wii Music or Rock Band this was a fun challenge for me! Janet said to make something musical and I had a lot of fun. First of all, I do not own a single musical image, embossing folder, or any extra images from swaps, so I set on a surfing journey to see what I could come up with. I found TONS of music related coloring pages and this guy looked like a great image for someone like my 14 year old son and Janet. So I asked Brendan for his help. He helped me pick just the right font, this is Pamela from Dafont.com and I found a layout that I liked from Tami Mayberry - I don't think I hit the mark on the layout, but I like it just the same. The dp is digi paper that I found on a blog that is no longer updated. So this card is for your own personal Guitar Hero. Happy Sunday! Thanks for visiting me. Head on over to Modern Sugar Blvd. - today there will be some new releases and a challenge found here. It will be posted sometime today. 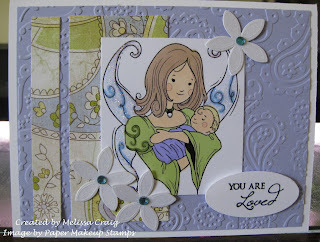 I've already shared this card style that I found on You Tube and I can't seem to stop making them. This is the easiest slider card ever. 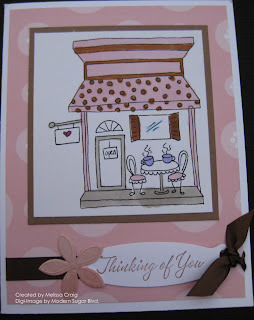 This card features two of the new releases and I just love the innocence and sweetness of these images. I also used digi-paper that I got for free from A Cherry On Top. The sentiment is mine. 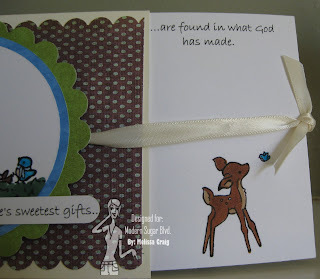 It says "Life's sweetest gifts..."
Then you slide the inside out "...are found in what God has made." I printed the deer and the inside sentiment and cut it so that I wasn't piecing it together. This is a little tricky because I had to eye how the ribbon was going to go across the card and not cover up anything. Now it's your turn! I can't wait to see what you make!! I wanted to share with you the Mother's Day cards that my children made for me. It didn't matter that they gave me a new clock and a water fountain for my kitchen - the cards said it all. First up is the card my oldest son made. Actually, I think he might've finished something his sister already had started. Although Hollyanne gave him full credit! I'm so proud that he chose to use one of the new Wild Sprouts stamps from TGF. 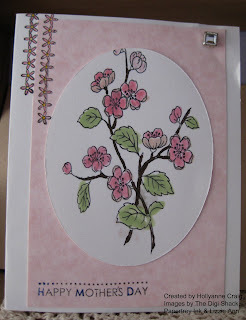 the Cherry Blossom image along with a sketch challenge. 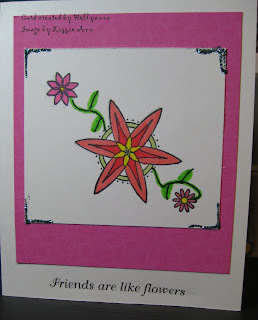 She colored the image with Stampin' Write markers, used Papertrey Ink stamp for the sentiment and added a bit of interest with a Lizzie Ann border stamp and then a small touch of bling. She did a great job!! And then last, but not least was my love letter from my youngest son. He made this at school and it's his very own design. He made the envelope, the card and all his words are his very own. He signed it "Love Sincerely, Levi"
I feel very loved by my children and I thank God everyday for them - even if they're bickering over which movie to watch, or squealing and running through the house when what you really want is peace and quiet. I wouldn't trade these noises, arguments or whatever for all the peace and quiet, stamps and markers for the world. I learned today that Kayleigh Anne Freeman is now playing amongst the clouds and dancing with Jesus. My heart goes out to these parents who finally got to hold their precious baby girl in their arms with nothing attached to her as her sweet little spirit floated to heaven. What a beautiful gift for them to have had her for these past 11 months, how that precious little girl has touched so many lives and made such a huge impact for being so small. Please visit their blog.